Drain albacore and flake lightly in a mixing bowl. Drain the artichoke well and chop coarsely; add to the albacore. Mix in pimiento, onion, and celery. Stir the olive oil, lemon juice, cilantro, oregano, and salt and pepper into the mayonnaise. Mix with albacore and artichokes. 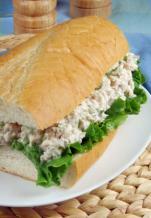 Lay the arugula out on the hoagie rolls and spoon the albacore mixture onto the rolls. Top with a bit more arugula and assemble sandwiches for serving.